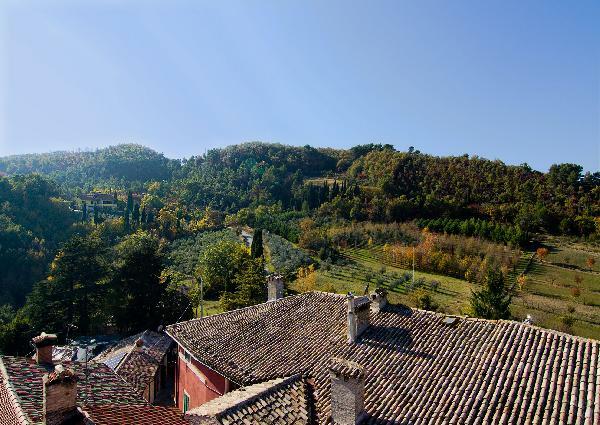 Nestled in the heart of the Umbrian hillside, just 12 minutes from the city of Spoleto, is the unspoiled Medieval village Rapicciano. 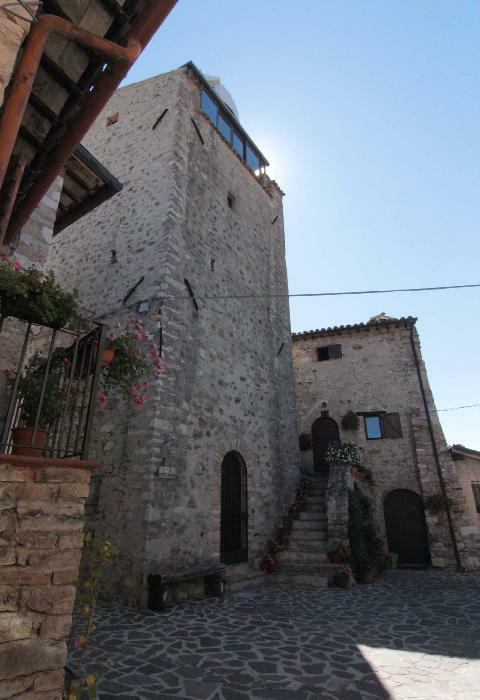 The village has a population of 15 to 25 and enjoys a panoramic hill-top position with spectacular views, on clear days, all the way to Assisi. The area is blessed with kilometers of car free forest paths, and little trafficked roads. Following the ancient Roman road, la vecchia Flaminia, for 20 minutes by car, 45 minutes by bike, one arrives at the Roman archeological splendor of Carsulae. By foot, mountain bike or car, the possibility for short and long nature and cultural excursions is nearly unlimited. 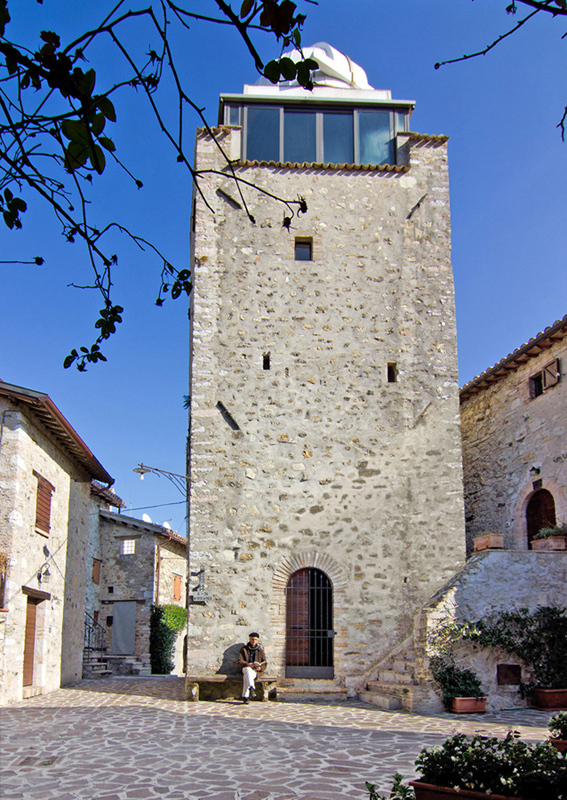 The Tower of Artists was formerly owned by a famous Italian actress, and later sold to Composer, Randall Meyers in the late 1990’s. 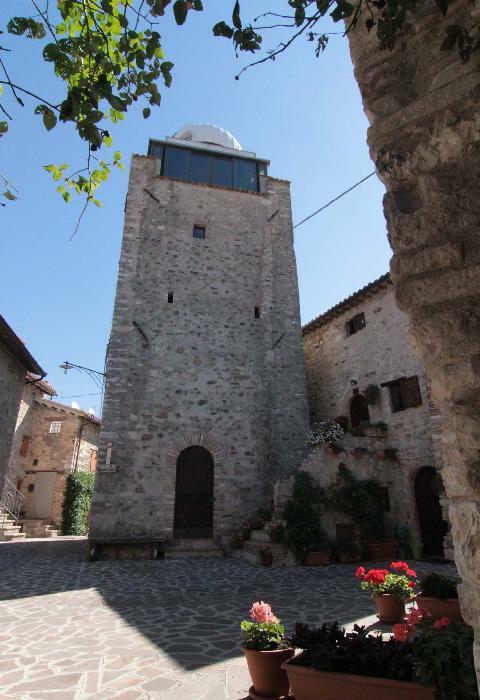 Mr. Meyers, who also has a house in Rapicciano, refurbished this tranquil edifice both for pursuing his composing profession as well as his passion for science and astronomy, turning it into a fully fledged astronomical observatory and writing studio. The observatory has been registered in the national registry armature observatories and is by law protected from light pollution. This, of course, also benefits the village with dark skies and romantic evenings with outdoor dinners. Villagers are friendly, helpful and enthusiastic about artists. Everyone is in principle left alone to work, but join together in the piazza whenever there is homemade pizza, fresh olive oil or the new wine. 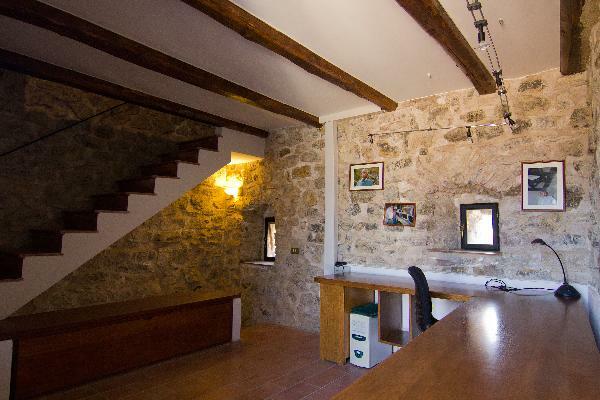 This home has been an inspiration for writers, composers, artists, and scientists alike. KITCHEN – The kitchen is fully equipped with utensils, cutlery, gas stove and electric baking oven, and a small service toilet. The double wooded doors open out onto the piazza for a relaxed summer lunch outside. BEDROOM - The bedroom has a Queen size Double bed, storage place for blankets and small stone wall candle or book shelves. The impression is something of monk’s cell or contemplation room. Very peaceful and restful. WRITING ROOM / STUDIO - This floor is ideal for any type of creative work. It has a massive handmade Chestnut table, bookshelves, storage space and computer space. 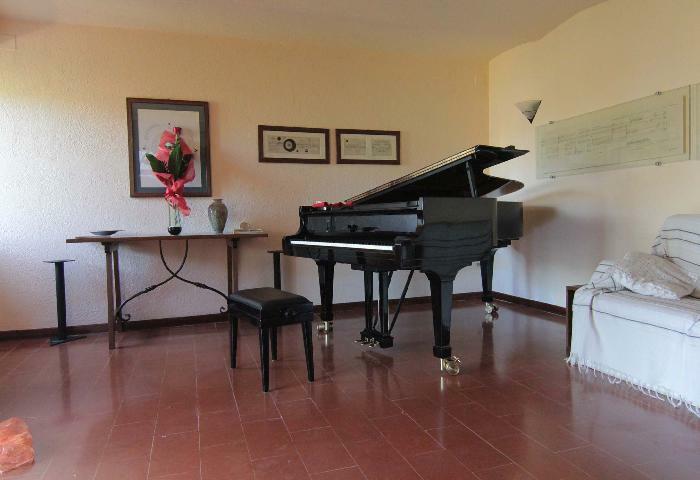 Films have been edited here and many a piece of music composed and scientific articles written. OBSERVATORY STUDIO - In the observatory studio one meets an ambient of breathtaking beauty. 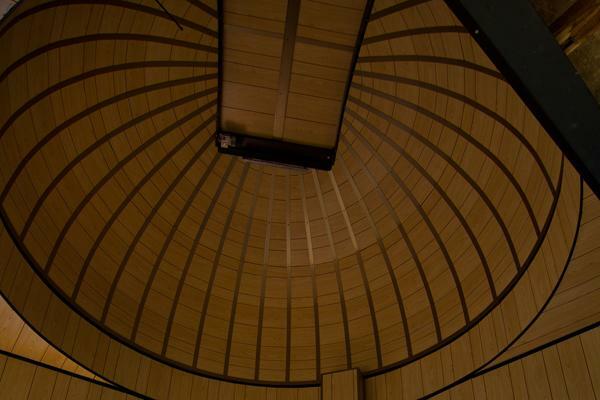 The observatory dome is fully functional and can be opened and rotated. 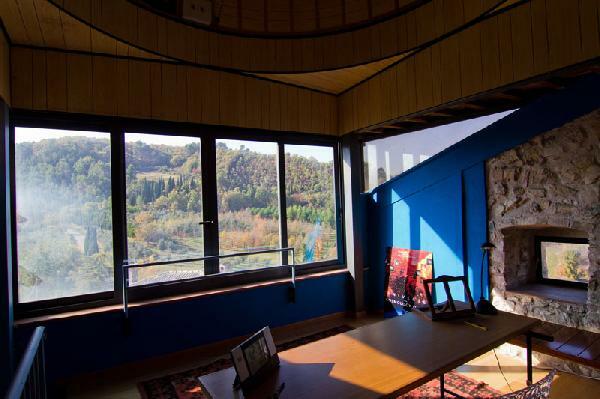 The sliding glass windows allow for a direct view of the Umbrian landscape while one works or relaxes. The floors are in parquet and it is also possible to have extra beds installed here for small groups or families. This ambient allows one a unique living experience while at the same time fostering the necessary comfort for realizing one’s projects, or just simply enjoying life. We offer sevices which include: cleaning personel once a week comprised in the rental fee; heating and electricity for weekly sojourns - also included in the price; For visits of a month or more special arrangements are considered. Send your reservation request here.